Since the beginning of the 2013 season, Anthony Abbasse and his Sodi/TM have shown remarkable speed at the highest levels of competition, though they have not been rewarded as deserved. It was probably during the German Championship round held at Wackersdorf, in the presence of a group of strong competitors, that Abbasse exploited at best the strengths of his Sodi powered by a TM factory engine. For once, no obstacle stood in the way of his success: he took pole in timed qualifying and conquered two victories in a row in races 1 and 2. 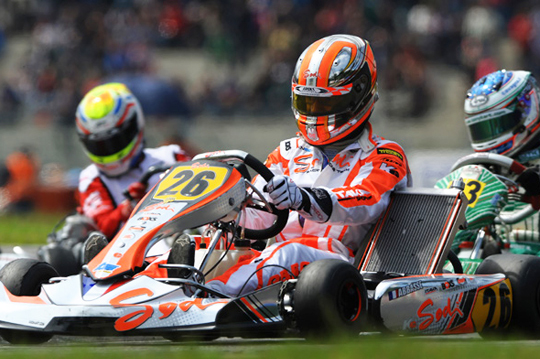 Two weeks later, at the opening of the European Championship on the same circuit of Wackersdorf, Abbasse showed again how fast his Sodi kart can be. He was always among the fastest drivers and regularly fought in the lead before he was heavily penalised for a questionable «Jump Start». But despite all this, he took third place in the pre-final and battled for a second place in the final race. Abbasse was still among the fastest at the closing round of the Championship, on the Belgian circuit of Genk. As had happened previously in Germany, gaps between the protagonists were so narrow that even the slightest problem had serious consequences. This time he was sent into a tailspin at the start of the first qualifying heat. He was 21st on the first lap, but pushed his kart to the limit on the still slippery track and regained as many as 13 places in less than 12 laps, at the end of an exciting catch-up race which made his accident at the start even more regrettable... Then Abbasse got back to the 5 in the pre-final and finally secured his third place in the European Championship.